In the year under review the HSRP adopted a twelve-year strategic framework aimed at guiding programmatic interventions in alignment with the Department of Basic Education's (DBE) "Towards the Realization of Schooling 2025". Introducing the DBE's Action Plan 2014, Minister Motshekga said: "We need a clear vision of where we want to be in 2025 and we must make sure that every year we move a bit closer to our vision". The HSRP has a relevant role to play in this vision for education in South Africa and the plans for its delivery. The HSRP's strategic objectives are in line with the DBE's goals and the six themes of the National Education Collaboration Framework (NECF) which seek to coordinate and integrate programmes aimed at improving the quality of outcomes in basic education. Linked to its core programme areas, the HSRP has consistently built the capacity of the school leaders, educators and learners to actively engage with and take ownership of opportunities on offer. Sharing lessons and insights through organizational and horizontal learning events continues to underpin the HSRP's programme work and organizational practice. The HSRP Education Officer's work constitutes 80% of human capacity development in schools. The remaining 20% is specialist outsourced interventions. Leadership development involves assisting schools with strategic leadership and management; using data to inform interventions and planning; mentoring and coaching using vast experience in educational leadership; ensuring regulatory compliance; School Governing Body training on roles and responsibilities, management versus governance, financial management and responsibilities in terms of the South African Schools Act 84 of 1996; ensuring viable, sustainable partnerships and collaborations. The key focus areas of the HSRP in school systemic improvement are support programmes to feeder schools (Reading and Numeracy programmes); Grades 8 – 9 English and Maths improvement programme that aims at boosting Language and Maths outcomes; study methods that assist learners in focused study methodologies. The Grades 10 – 12 Improvement Strategy entails extra Maths and Science classes to increase the quality and quantity of passes; extra classes in killer subjects in identified schools, to increase quality and quantity of bachelor passes and study methods. The emphasis is on holistic support and pressure from Grade 8 – 12 and not just at Grade 12 level. This includes tracking retention rates and ensuring learners finish the 12 years of schooling; management and leadership development (Principals and SMTs); teacher development, especially on subject related competencies and governance development including RCLs. 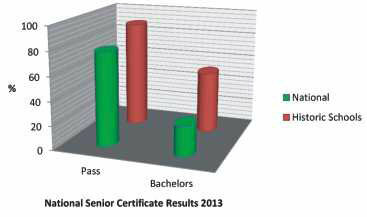 The National Senior Certificate results of 2013 reflect a steady improvement of the overall pass rate. The historic schools outperformed the national average of Bachelors passes by 26 percent.